New Zealand's manufacturing sector continued its upwards momentum for May, according to the latest BNZ - BusinessNZ Performance of Manufacturing Index (PMI). The seasonally adjusted PMI for May was 57.1 (a PMI reading above 50.0 indicates that manufacturing is generally expanding; below 50.0 that it is declining). This was 0.5 points higher than April, and the highest level of expansion since January. The sector has been in expansion in almost all months since October 2012. BusinessNZ's executive director for manufacturing Catherine Beard said that the key components to the overall PMI result continued to show strong results. "Production (61.1) lifted its head above the 60-pint mark for the first time since December 2014, while new orders (59.9) has remained within a tight band range of 2.5 points since November 2015. In addition, the proportion of positive comments rose to 66.4%, with a number of positive comments pointing to business as usual and a steady flow of activity/orders." BNZ Senior Economist, Craig Ebert, said that "the production readings in the PMI have certainly kept our chins up, when recent results on manufacturing GDP have looked a bit wobbly." 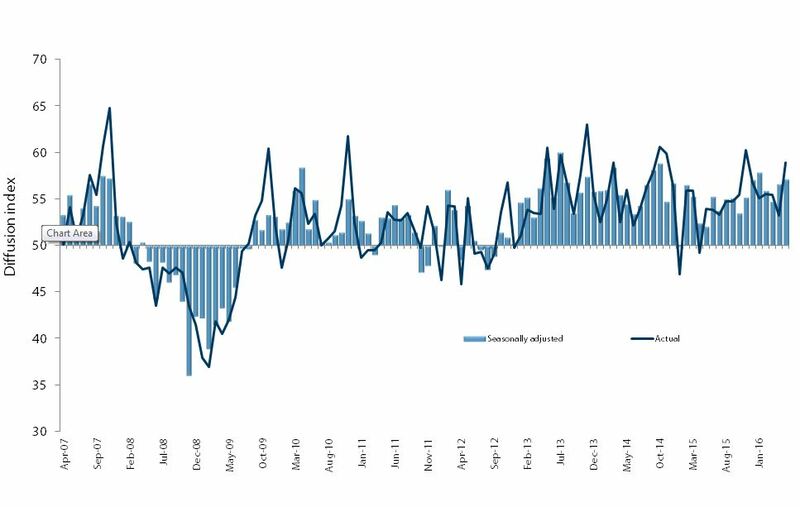 New Zealand's Performance of Manufacturing Index (PMI) firmed a bit further in May, while its details were even more encouraging. The production readings in the PMI have certainly kept our chins up, when recent results on manufacturing GDP have looked a bit wobbly. One of the brighter spots in the Q1 GDP accounts was around forestry. Having had a great run, activity-wise, post GFC the industry struggled a bit over 2015. However, there were signs of renewed life in the March quarter of this year. All things considered, Australia is still New Zealand's largest trading partner. And so it's worth noting that Australia's economy has been digesting a pronounced correction in mining investment, to be performing relatively well, overall.